Have you ever wondered what went on at the Poole Royal Ordnance Factory in Sopers Lane, Creekmoor, during and after the war? 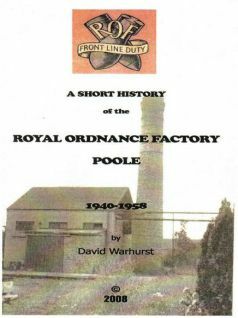 A publication has been written by David Warhurst detailing the history of the ROF at Creekmoor which also contains photographs and illustrations and is to his knowledge the only publication related solely to the Poole Royal Ordnance Factory. The factory was built in 1940 and employed over 2,000 people during the war years. The ROF finally closed in 1958 but the site remains and is currently mainly occupied by Siemens. Prices 2009. Check current prices with author.